Peat smoke on the nose, nicely mixed with roasted ham, crisp barley and a touch of coal ash. Slightly medicinal character with bandages, followed by sweet sherry notes and delicate spices in the back. Deliciously sweet start on the palate with barley sugar, cereals, vanilla and subtle sherry. Then quite warming with lots of spices - white pepper, cardamom, nutmeg, cloves and dry oak. BBQ notes with bonfire smoke. Qily with a touch of orange peel and salted caramel towards the finish. The finish is long, warm, sweet and dry. Smoky, peaty with a touch of lemon and crisp cereals, mixed with coal ash on the tail. Significantly spicier on the nose when a few drops of water are added. Roasted bread mixed with peat and bonfire smoke. The warming spiciness is noticeably tamed while more sweetness and coal ash are coming through. The finish is long, slightly warm and very dry with oak, peat smoke, oyster-like flavours and hints of seaweed. 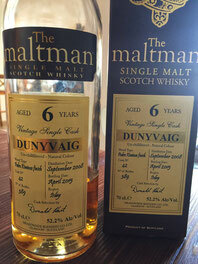 An impressive single malt, considering that it is only 6 years old. A delicate sweetness paired with a warming and complex mix of spices: multi-layered and full-bodied. Luscious, smoky, maritime and wonderfully palatable. This dram doesn't need any water! Which distillery? No idea, as Dunyvaig Castle is located on the shore of Lagavulin Bay!